The first electric dynamo was constructed in 1831 by Michael Faraday. An electric dynamo is, of course, a device which transforms mechanical energy into electrical energy. An electric motor, on the other hand, is a device which transforms electrical energy into mechanical energy. In other words, an electric motor is an electric dynamo run in reverse. It took a surprisingly long time for scientists in the nineteenth century to realize this. In fact, the message only really sank home after a fortuitous accident during the 1873 Vienna World Exposition. A large hall was filled with modern gadgets. One of these gadgets, a steam engine driven dynamo, was producing electric power when a workman unwittingly connected the output leads from another dynamo to the energized circuit. Almost immediately, the latter dynamo started to whirl around at great speed. The dynamo was, in effect, transformed into an electric motor. and use has been made of the results of Sect. 9.6. 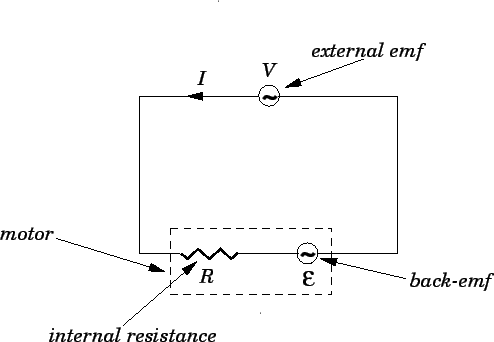 Figure 43: Circuit diagram for an AC motor connected to an external AC emf source. By conservation of energy, is also the rate at which the motor performs mechanical work. Note that the rate at which the motor does mechanical work is not constant in time, but, instead, pulsates at the rotation frequency of the coil. It is possible to construct a motor which performs work at a more uniform rate by employing more than one coil rotating about the same axis. As long as , the rate at which the motor performs mechanical work is positive (i.e., the motor does useful work). However, if then the rate at which the motor performs work becomes negative. This means that we must do mechanical work on the motor in order to keep it rotating, which is another way of saying that the motor does not do useful work. Clearly, in order for an AC motor to do useful work, the external emf must be able to overcome the back-emf induced in the motor (i.e., ).